We've made it halfway through the work week and I decided to take a day off to head off the mountain and do some SHOPPING! 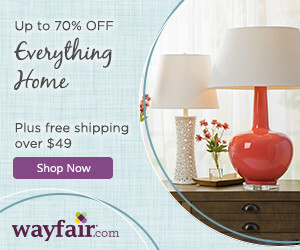 It has been ages since I've been in a Home Goods or a Marshalls or in Michaels....I'm pretty excited, not gonna lie! But before I go I thought I'd share a recipe that comes together quickly for a weeknight meal, providing you do some simple prep work in the morning. My very dear friend shared this recipe with me years ago and I've never changed the base recipe in the slightest - it's so amazingly good, incredibly easy to make, and so perfect there's no need to alter it. 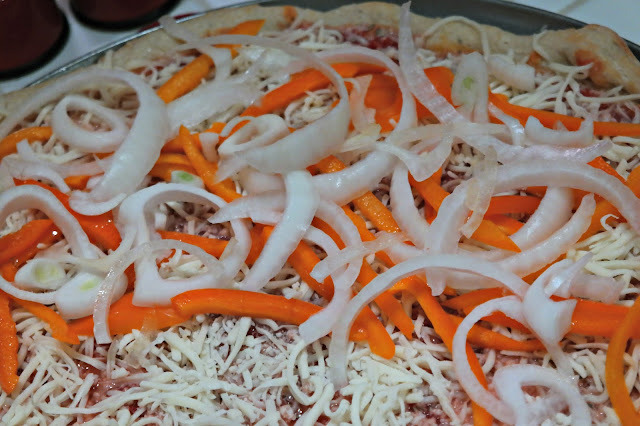 The only thing that changes are the toppings, depending on my mood and/or what's in the fridge. 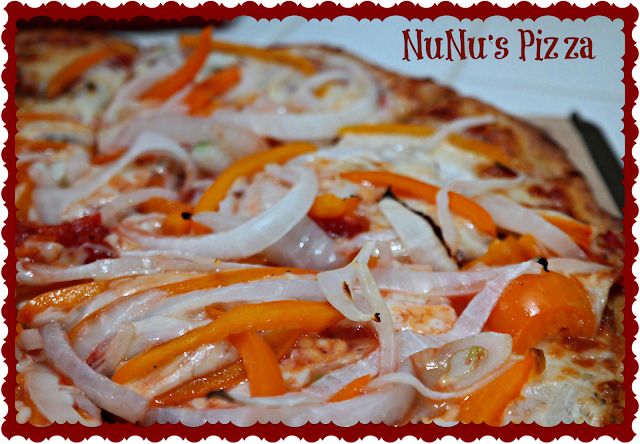 Ok here we go - welcome to NuNu's Pizza! 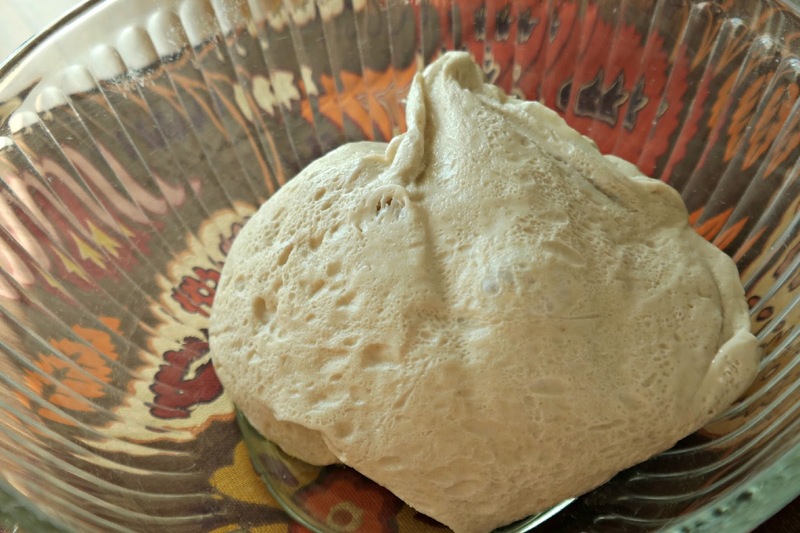 I use ready made pizza dough that I buy in my supermarket. It comes in a plastic bag in the dairy aisle in my market. Not the pre-made rounds but rather the bag of goopy mushy dough. I keep some in the freezer and leave it out for a day in the fridge when I am getting to the "I need pizza" point in my life. You know that feeling, right? In the morning the only prep you need to do is take out the thawed dough, cut it out of the bag, and dump it into a large bowl that you have drizzled a little olive oil in. 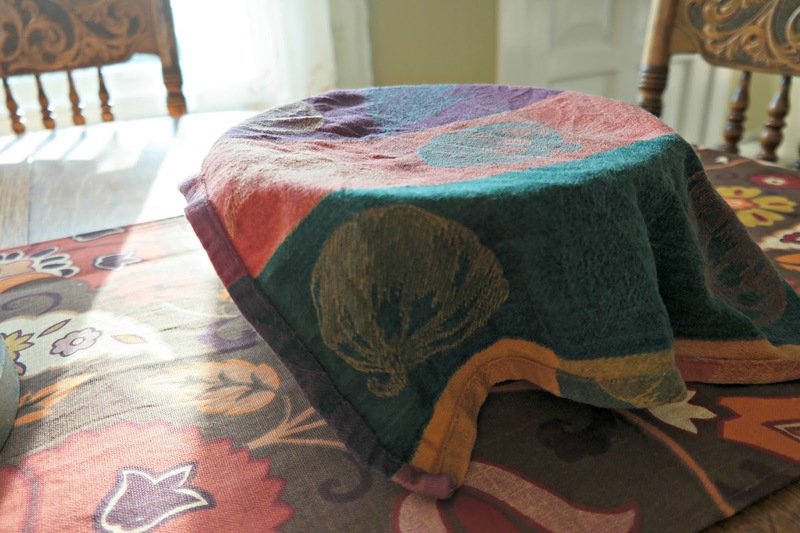 Cover it with a damp tea towel and put it in a warm place in your home. That was tough, right? Sorry about that. ....so make sure you use a large enough bowl. And the damp towel is important to keep the top of the dough from drying out and getting kind of hard. 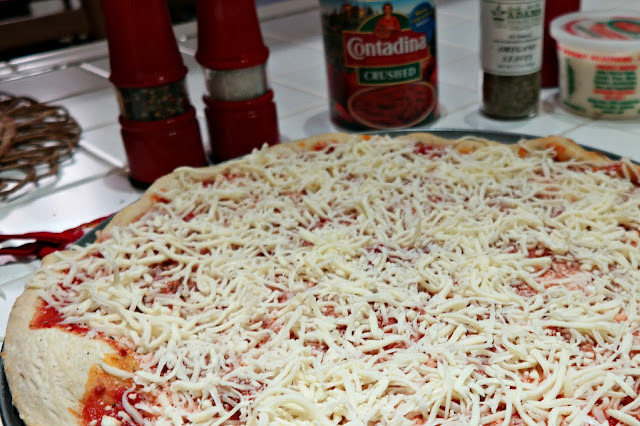 Gather your ingredients: a can of crushed tomatoes, a bag of shredded mozzarella, some grated Romano or Parmesan cheese, dried oregano, salt, pepper, olive oil, all purpose flour, and any toppings you'd like. I went with onions and peppers. Just because. Open the can of tomatoes first to let it breathe. An hour prior is ideal but if you don't have an hour to kill it's not a huge deal. Preheat the oven to 550. 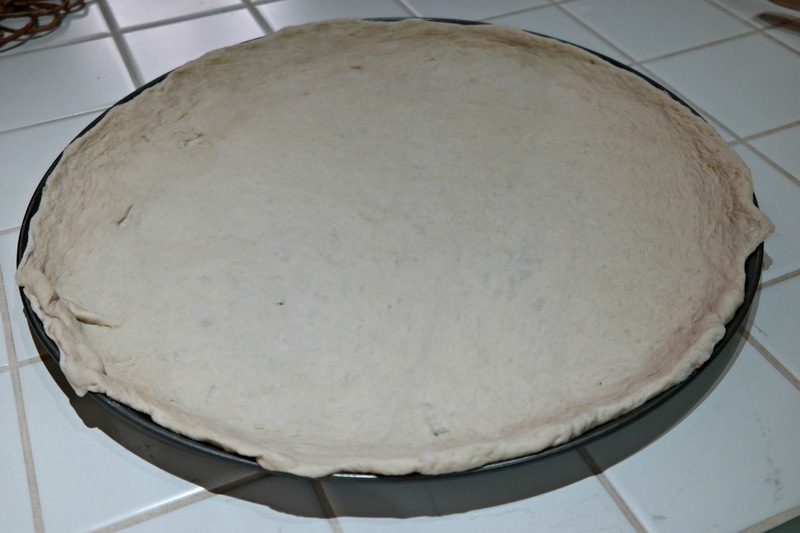 If you have a pizza stone place it on the rack in the oven to preheat with the oven. The pizza stone should be situated in about the middle of the oven. You will need to roll out the dough. I roll it out on Silpat mats on my counter, two placed right next to each other. 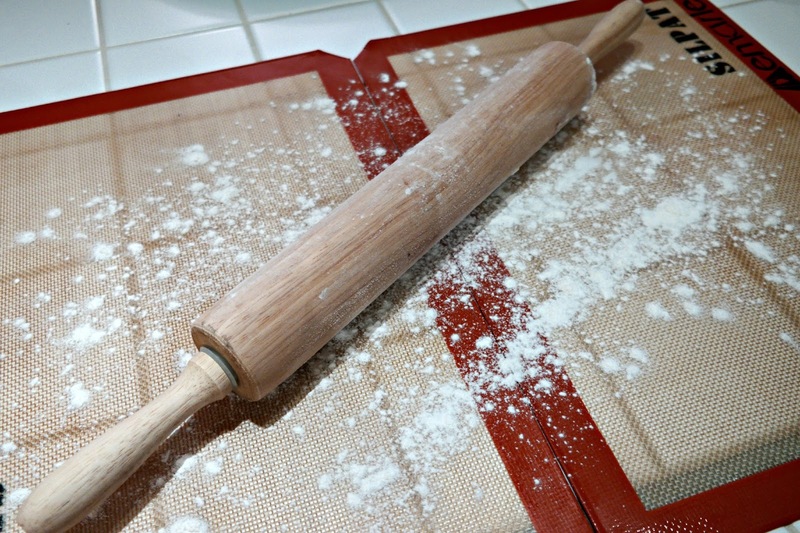 Sprinkle your work surface and your rolling pin with all purpose flour and rub it around with your hands. 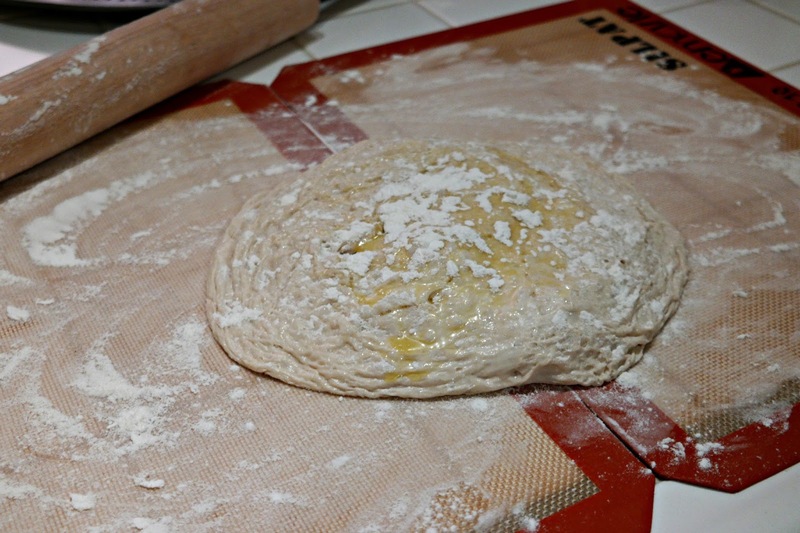 Roll out the dough until evenly flat. No, I can't throw it up in the air and stretch it out that way. I'd probably get it stuck in my skylight. 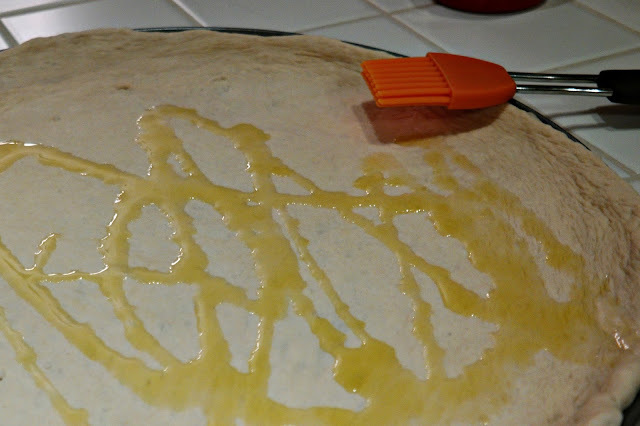 I use a Calphalon non stick pizza pan for my pizza but you can also make this on a cookie sheet or baking tray. The pizza pan is perforated so you get a crisper crust. Stretch out your dough gently to the edges of the tray. If you make a hole in the dough just squish the edges together again to seal up the hole. 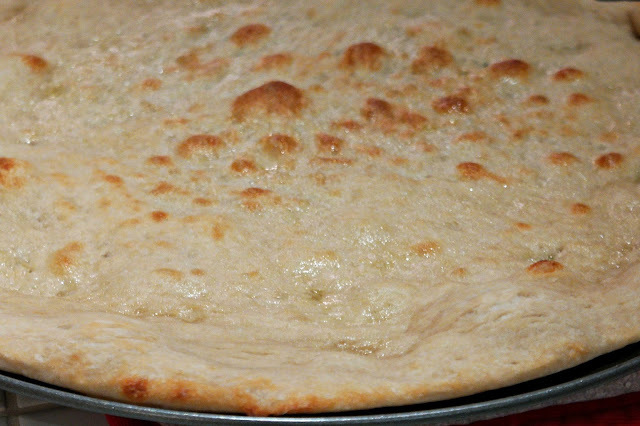 Drizzle the dough with olive oil and brush it around evenly. 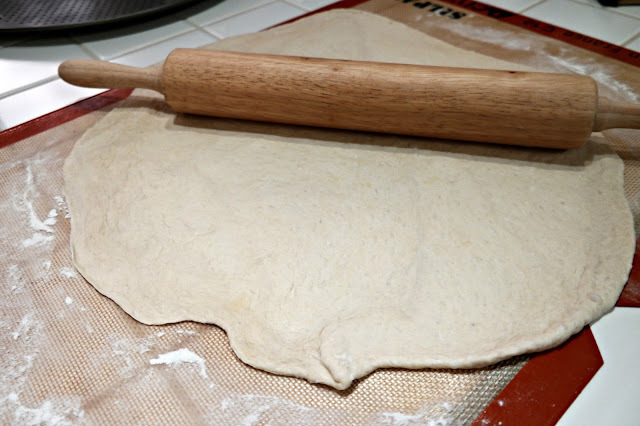 Take a fork and poke holes all over the dough, except around the edges. Par bake it in your pre-heated oven for just a few minutes until it starts to get golden brown. 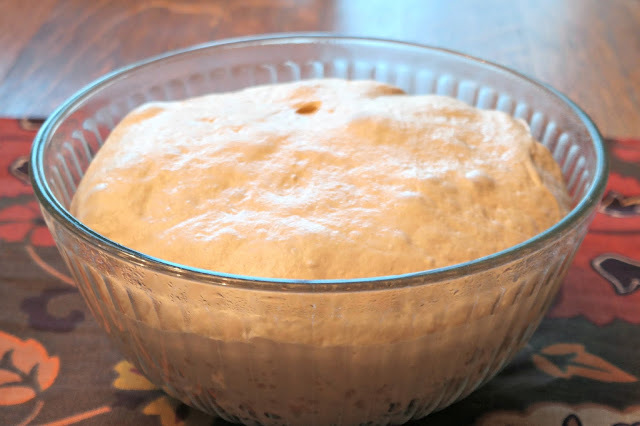 Watch it carefully - you don't want it fully cooked, you just want to give it a head start so when you bake the finished product the dough is not soggy. 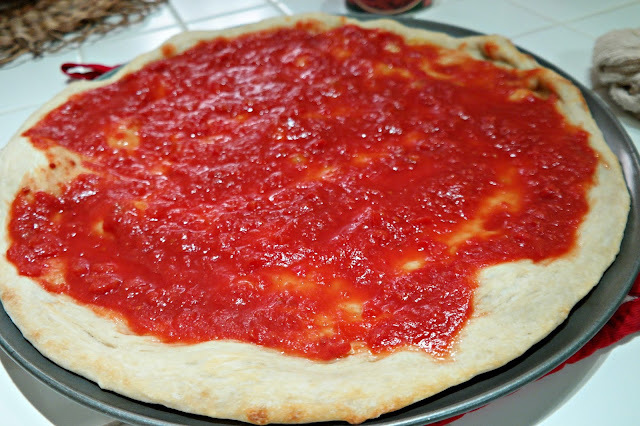 Time to add the crushed tomatoes - spread out an even layer to about an inch from the edge. Sprinkle liberally with grated Parmesan or Romano cheese. Add salt, pepper, and some dried oregano. 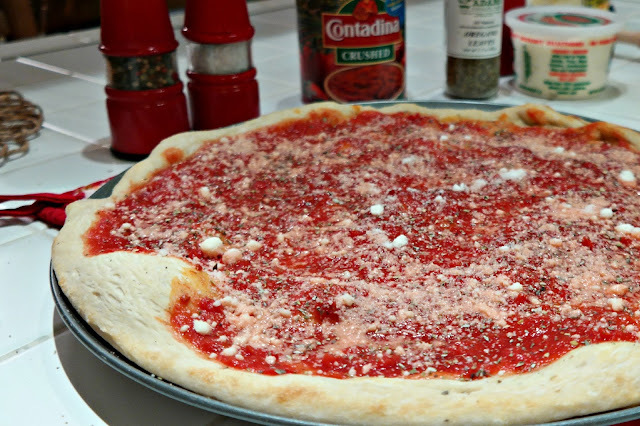 I go light on the salt - there's enough salt between the canned tomatoes, the dough, and the two cheeses to suit my tastes. Now comes the good part - CHEESE! 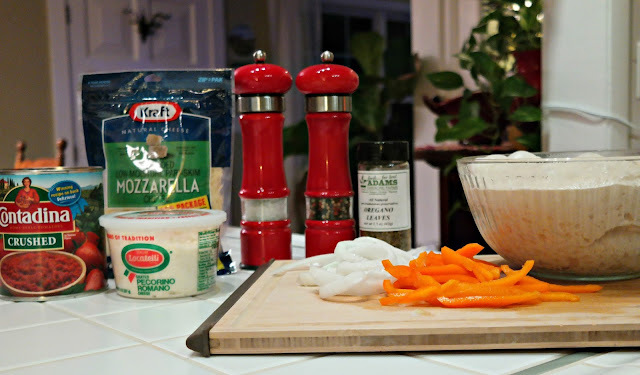 I use the whole bag of shredded part skim mozzarella. 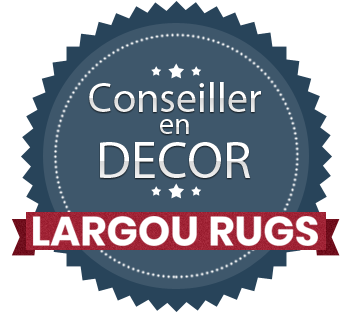 You can feel free to use less or more to suit your taste. 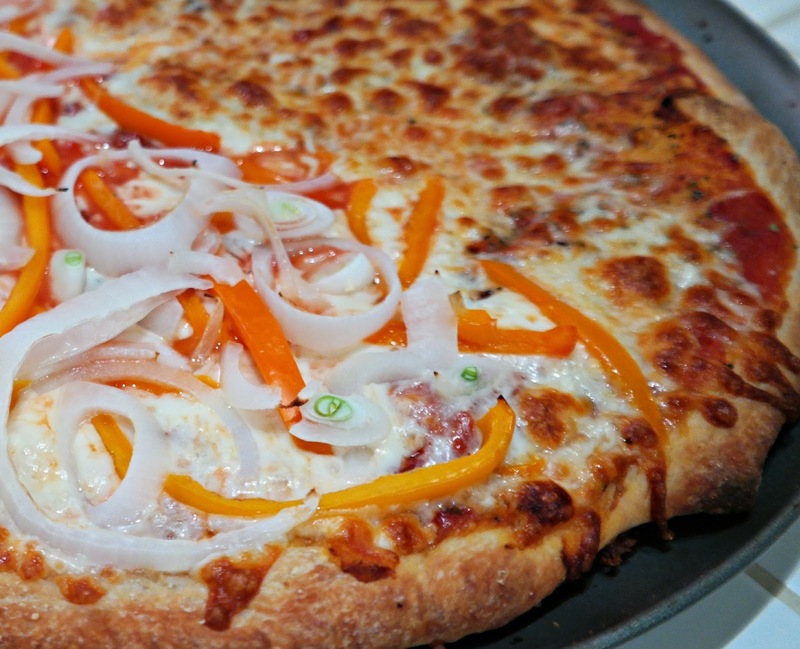 And I decided to do half with sliced peppers and onions. Bake for about 10 minutes or so, keeping an eye on it, until it looks like...well, PIZZA! Take it out and set aside for a few minutes before slicing it and serving it to the very special people in your life that you think deserve the very best pizza! Oh it is, Lori! 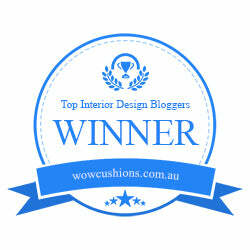 Thanks so much for the visit!! Totally worth every single calorie, Valerie!! Looks yummy! Maybe you need to teach cooking lessons. 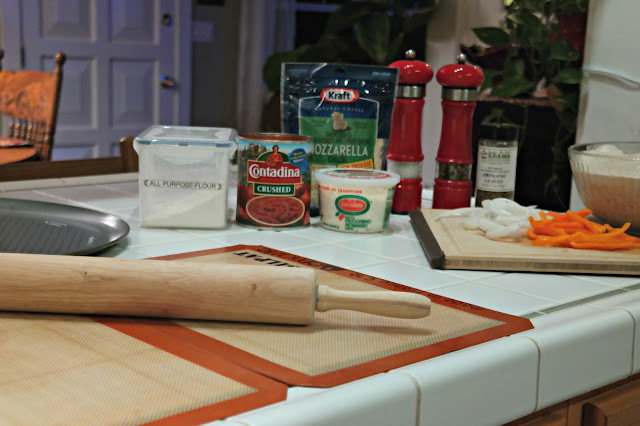 I think this is my way of teaching cooking lessons....right here on the blog, Brenda!! Yum! I made pizza tonight! Home made pizza is the BEST!! I think I love ALL pizza!!! But yes, home made pizza is awesome - and I love that I can control the ingredients I'm putting in my body. I am so glad that I am reading this while having lunch and not when I am hungry! :) Looks delicious! I wish I had some leftover pizza for lunch today! You don't know how good you have it, kid!! 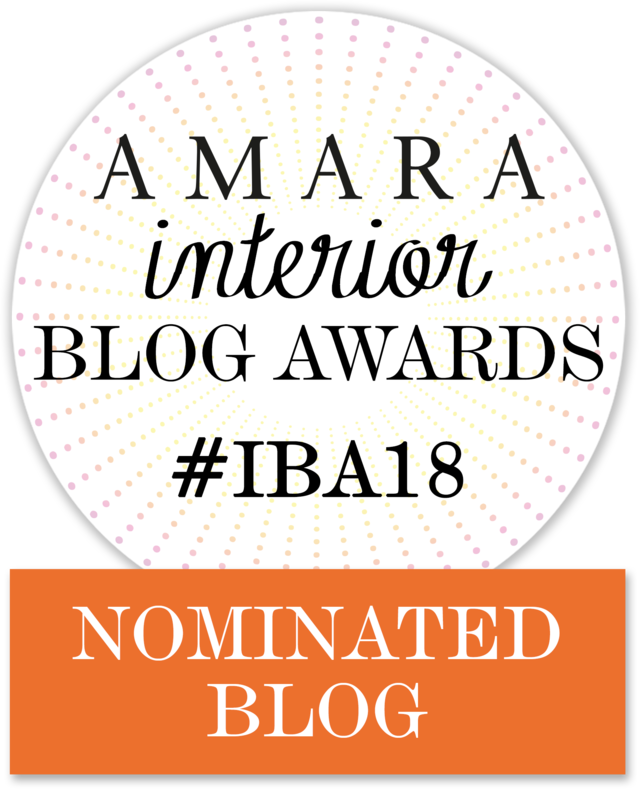 You have NO idea how much I needed this post! I made two pizzas last night and while they were delish, the crust wasn't what I had hoped. I didn't know to leave it out that long Debbie. I'm going back to reread this and pin! I don't think the package says to leave it out that long but that's what I do and it works!! Ahhhh the very Nu Nu who gave me this recipe so long ago - how did I do, my friend? My sweetie got me that pan but I have another like it I got online, probably at Amazon.